With parliament adjourned for summer break, Canada’s House of Commons has been largely void of its elected officials. Nevertheless, important discussions on the health and future of democracy in Canada have still been taking place in Ottawa. 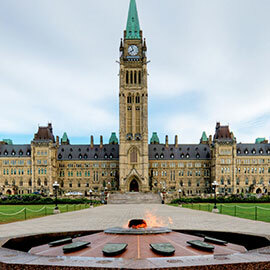 Laurier Political Science Professor Brian Tanguay was among the experts testifying before the Special Committee on Electoral Reform — created in June 2016 to explore, among other topics, possible alternatives to Canada’s first-past-the-post voting system. Tanguay, who authored a major report on electoral reform for the Law Commission of Canada in 2004, believes that some form of proportional representation would be better for Canada to achieve electoral fairness and reach important public policy objectives than the first-past-the-post system in place today. A major impetus for electoral reform at both the federal and provincial levels came about in the late 1990s and early 2000s, when a number of groups in civil society argued that changing our electoral system could be one way to address a growing democratic malaise. According to Tanguay, this disappointment and general sense of dissatisfaction with politics in Canada can account, in part, for low levels of voter turnout among certain age groups, for example. "The vast majority of countries that use a form of proportional representation tend to have beneficial results in terms of overall voter satisfaction with how the system operates." Tanguay identifies several areas where he feels first-past-the-post exhibits shortfalls. “With the existing system, we have experienced the problem of wrong winners, such as in Quebec, where a party will get a plurality of votes but will lose the election,” says Tanguay. More fundamental, Tanguay says, is the inherent disincentive to collaborate. Tanguay believes that it is only through sharing power by having stable minority or coalition governments, that this problem can be remedied. Because parties are looking to reach a majority in the current system, Tanguay says almost everyone is trying to undermine the actual collaboration or minority government situation. Using proportional representation, on the other hand, would force parties to collaborate. Tanguay also blames first-past-the-post for generating barriers to electing new kinds of politicians from under-represented sectors in society. “It discriminates against smaller parties, like the Green Party, that have widespread support across the country or the province,” says Tanguay. When New Zealand held its first election in the 1990s after moving to mixed-member proportional representation, one of the first things noticed was the increase in elected women and Indigenous candidates, says Tanguay. Tanguay’s research has focused largely on the strengths and weaknesses of political parties as representative organizations. His forthcoming book, Canadian Parties in Transition (fourth edition), co-edited with Alain-G. Gagnon, will be released in September. Tanguay and department colleague Barry Kay authored a report for the Royal Commission on Electoral Reform and Party Financing in the late 1980s, which explored campaign life and how business and other interest groups try to have their voices heard during elections. Tanguay was frustrated to find that major electoral reform was excluded from the commission’s terms of reference — especially when other countries were investigating the issue in a serious way. The opportunity to address electoral reform arose for Tanguay in the early 2000s, when the Law Commission of Canada asked him to write its final report following a cross-country public consultation on the topic. Tanguay heard over and over again from Canadian voters looking for fairness and the equitable treatment of political parties in election results. Two major reports and years later, Tanguay is cautiously optimistic that the Trudeau government will come through on its election promise to introduce legislation to enact electoral reform. He believes that the government could have legislation ready within two years. “The vast majority of countries that use a form of proportional representation tend to have beneficial results in terms of overall voter satisfaction with how the system operates,” says Tanguay. He’ll now eagerly wait to see how the results of cross-country public consultations and his testimony will make their way into forthcoming legislation on the future of Canadian democracy.